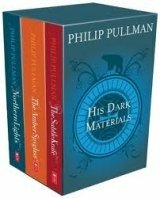 "Northern Lights", "Subtle Knife", "Amber Spyglass" Philip Pullman's bestselling trilogy in one slipcase. Since the first volume was published in 1995, and has now been filmed as THE GOLDEN COMPASS, the trilogy has been acclaimed as a modern mastrpiece, and has won the UK's top awards for children's literature. Today, the fabulous story of Lyra and her daemon is read and loved by adults and children alike.